The modern world, with its common information space, is becoming increasingly compact and informal. In art, it looks the most obvious and significant. Nowadays a creative person feels like a World Citizen, where contemporary art has become truly international. The exhibition is unique in the way that along with American artists, there are artists who are well known in Europe, but for the first time exhibiting their work in the United States. The exhibition presents artists whose works are in the collections of famous people, presidents of European states, in national museums, funds of famous companies, as well as in permanent exhibitions of leading European galleries. Anna Miklashevich, Olena Pryduvalova, David Sharashidze, Irina Rodnikoff, Ola Rondiak, Petro Smetana, Olga Nenazhivina, Boris Yeghiazaryan, Anna Zaiachkivska, Mykola Zhuravel. 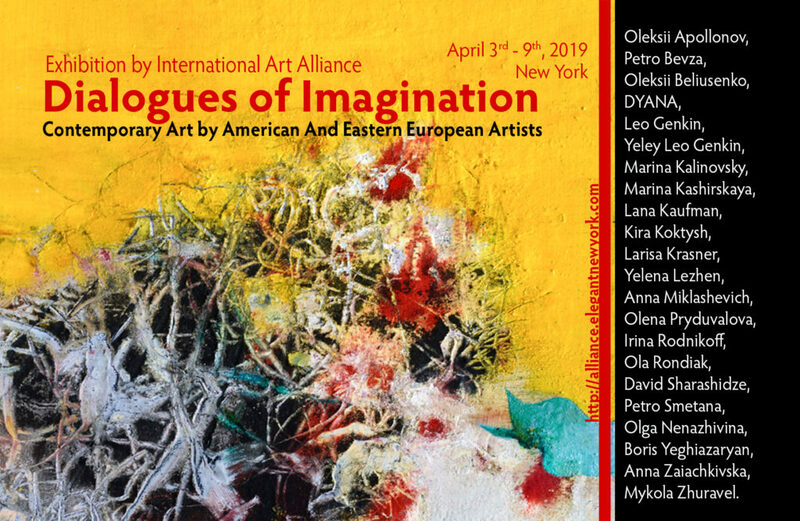 When the works of artists from 6 countries are shown in one exposition, the theme – Dialogues of Imagination, acquires a special meaning. 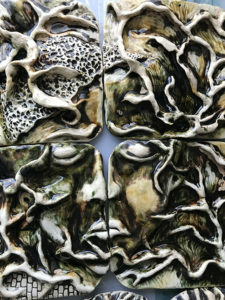 The exhibition forms a free dialogue of creative individuals with a unique artistic experience, original vision, and a complex spectrum of emotions. Artists engage the viewer in an active dialogue, offering to become a referee in their creative discussion. Figurative and abstract painting, expressionism, realism, minimalism, primitive art, graphics and ceramics – a wide range of works will allow guests of the exhibition not only to find “their picture”, but also to gain new experience in the knowledge of modern art. On the Ukrainian side, curators Mariana Djulay and Victoria Stepanets worked on the preparation of the Exhibition. Mikola Zhuravel – an artist whose work is distinctive and recognizable. The style of his painting has complex mathematical and architectural developments, based on which the artist reproduces images of the modern urban environment and blurs the boundaries between painting and sculpture. 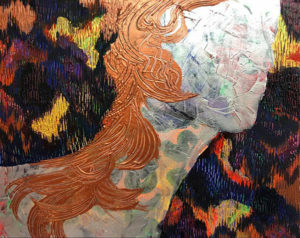 Petro Bevza is a famous Ukrainian artist who works with various technics and actively experiments with textures. The work of Peter Bevza is diverse: there are both bright abstract series and canvases, soaked with symbolic images build a bridge between the past and the future. 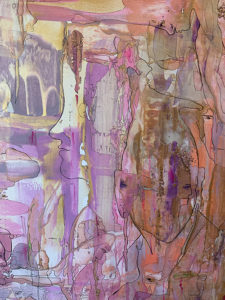 The artist pays special attention to the connection of space and color through the light, gives the viewer a sense of spatial infinity. Olena Priduvalova is a Ukrainian artist working in the style of painting, drawing and decorative arts. “Kiev” theme is central to the artist’s work: with the help of intense colors and playing with light, Elena conveys the mood of landscapes and streets of the capital. 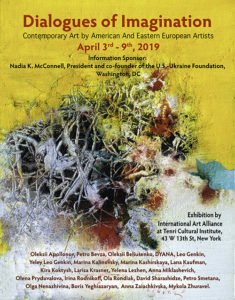 Elena is the laureate of the “Outstanding Artist of Ukraine” award (1998) and the participant of numerous group exhibitions in Ukraine and abroad. Oleksiy Belyusenko is a Ukrainian artist of Kazakhstan origin, whose series of works combines semi-abstract landscape painting. 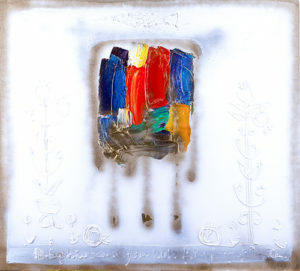 The palette of his canvases gives it depth and mysticism, from which sacral meanings are born. 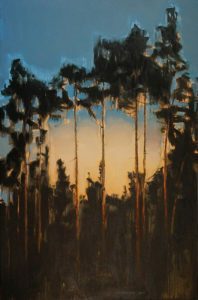 The works of Alexei are presented in private collections and galleries in 30 countries. Oleksiy Apollonov – Ukrainian painter and graphic artist. In his work, Oleksiy emphasizes the importance of the unexpected and the power of surprise. With these emotions he conveys his personal outlook to the viewer. 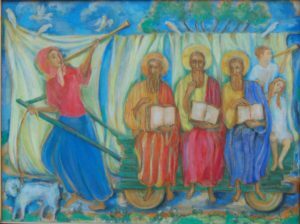 The work of Apollonov is filled with a wide variety of genres – abstract and non-figurative painting, primitivism, plot compositions and landscapes. The artist is experimenting a lot with color. Petro Smetana is a young Ukrainian artist who, in an original style, creates abstraction of images of the material world, as well as landscapes of cities and nature, filled with a complex mood and philosophical meaning. 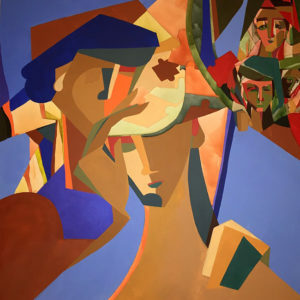 Boris Yeghiazaryan is a Ukrainian artist of Armenian origin, any abstract work created by him has a philosophical plot. The iconographic motifs of Boris’s works are enhanced by the play of deep colors. 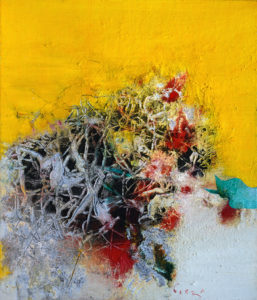 Boris, is recognized as one of the most prominent artists of Ukraine. 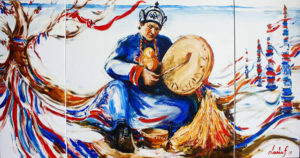 David Sharashidze is an artist whose work is saturated with the spirit of Georgia. The main element of the artist is color, and the compositional component of his canvases is characterized by rigor and thoughtfulness. Ola Rondiak was born and lives in US. 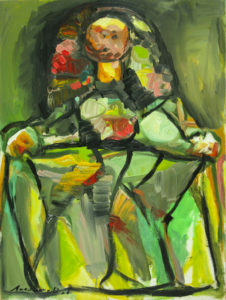 Anna Zaiachkivska (Zaia), lives in US. Anna is a Ukrainian-born artist whose signature paintings merge modern abstract influences with classical depictions of religious iconography. After receiving her MFA, she continued to advance her style, and began taking a more abstract approach. Her highly geometric figures and designs have attracted international attention, and have led Zaia to continue to push herself stylistically, finding her own unique way to convey and translate complex emotions. Previous big group art show at HG Contemporary Gallery named “Surface[s]” was on August 9, 2018 in New York. Yelena Lezhen lives in USA. 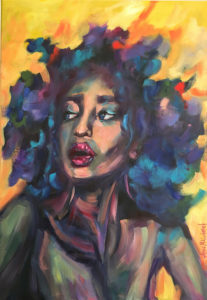 The artistic explorations by Yelena Lezhen immediately capture one’s attention due to her extraordinary gift for self-expression through synthesis. For the artist ─ Ukrainian by origin, American by adoption ─ the key moment in pictorial representation, aside from artistic details or virtuosity, is the special importance conferred to symbols. 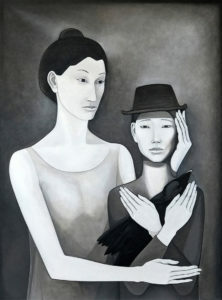 Olga Nenazhivina: My parents always lived an artistic life and when they had me, they had no doubts I would be an artist. By looking at them I had no doubts as well. They put me in old suitcase, which became my first bed and my first art studio; there I found my first pencils. My parents moved from one place to another and I drew, drew, drew. That was a happy time. I used to draw on any surface I could possibly find – on paper, walls, and asphalt, everywhere. I loved reading books with paintings of great artists and anatomy books as child. My mother used to help me to finish my first drawings and father used to explain to me what composition means and how to make a drawing complete. And when I turned four, I began to call my activity work. Most important, I knew what art was. Now this world gives me information, and all that I see and feel – I put on paper. Marina Kalinovsky: The images come from the past, from longing and memories, but they are always provoked by combination of colors or the beauty of a gesture. There is hidden magic in everyday life. As each image has reflections, one can peel them endlessly, layer by layer. Talented and extremely devoted to art people whom I was lucky to meet in my life, (including my husband) were, probably, the best inspiration for me. DYANA (Yana Dubinina) was born in Prague, but soon moved to Ukraine, where she received a Bachelor of Art degree . For more than 15 years she has been professionally engaged in painting, creating works in various genres: portraits, still life, landscapes. 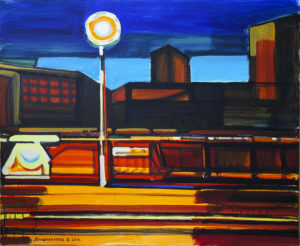 «My paintings are about people and about travels that have been part of my life since my childhood. I draw psychological images, emotions and feelings. 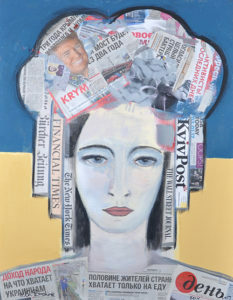 I depict them as dynamic, bold and expressive», – says Yana. Irina Rodnikoff live in USA. 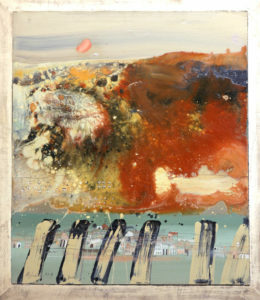 She is a multi-disciplinary artist currently working with installation, sculpture and painting. 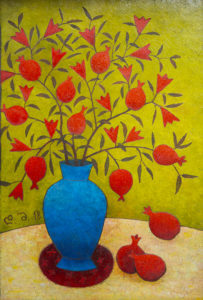 In oil and acrylic paintings her experience of the world is reflected by use of color, which is natural in its simplicity, bright and contrasting – a celebration of self-determination. 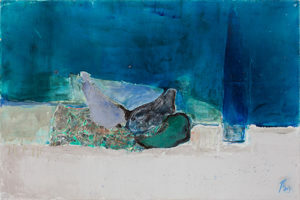 She received the TOW International Research Award in 2019, the CUNY Shaw Award «Winner for Excellence in Painting» in 2015, Bernard Horlick Memorial Scholarship in Visual Arts and Art History Award in 2016, and MUSA International Art Space Woman Artist Award. 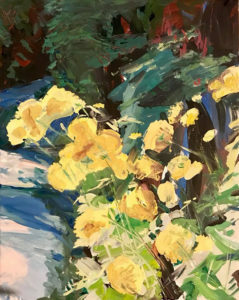 Lana Kaufman was fond of painting from her childhood. But began to exhibit actively five years ago, since she visited Baikal. This place inspired Lana to create her first art series «Places of Power». Lana was born in Uzbekistan. In 2017 she graduated from the National Academy of Cultural Arts, and received a Master’s Degree in Fine Art. 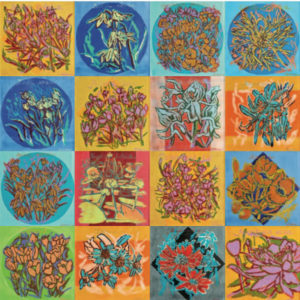 Larisa Krasner: My work is driven by historical facts from last century and current events in the form of urban and abstract art. My pieces are reminders of historical atrocities, camouflaged in beautiful settings. Kira Koktysh: Fusion of traditional organic earth elements and modern materials. Our jewelry is focusing on beauty of natural semiprecious stones. It enhances our aspiration for living in harmony with surrounding world, subtly emphasizing our inner being. Leo Genkin. My name is Leo Genkin and I am a master goldsmith. 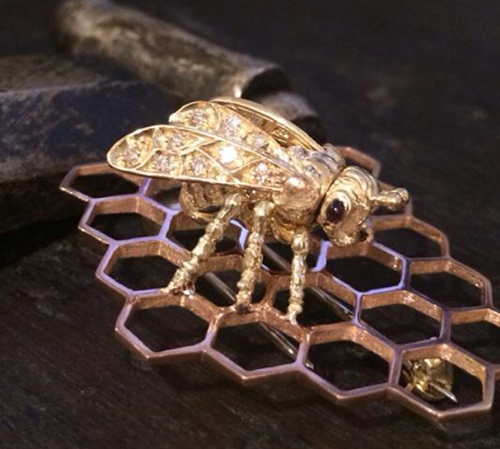 At the age of 17 I began creating jewelry under the guidance of a well-known filigree master, George Vasilyev. I obtained the highest professional state ranking for goldsmith in 1986 and opened my own special order jewelry business called Pearl of Russia. I won a contest for my crown design for the First Miss USSR Pageant in 1989. In 1990 and 1991 I continued to make crowns for miss USSR. In 1991 I made the crown for the First Miss Russia contest. I has made over 50 works of jewelry for various Regional Beauty Contests. After my immigration to United States in 1992, I completed several courses at Fashion Institute of Technology’s Jewelry Department under well known jewelry design professor Maurice Galli Several collections of jewelry were created and are presented in the jewelry galleries of New York, London and Moscow. I opened my own jewelry school. I also taught at 92 Y in New York. The current collection I would like to offer you for review and sale in your gallery is made in the style of Neo ArtNovo. 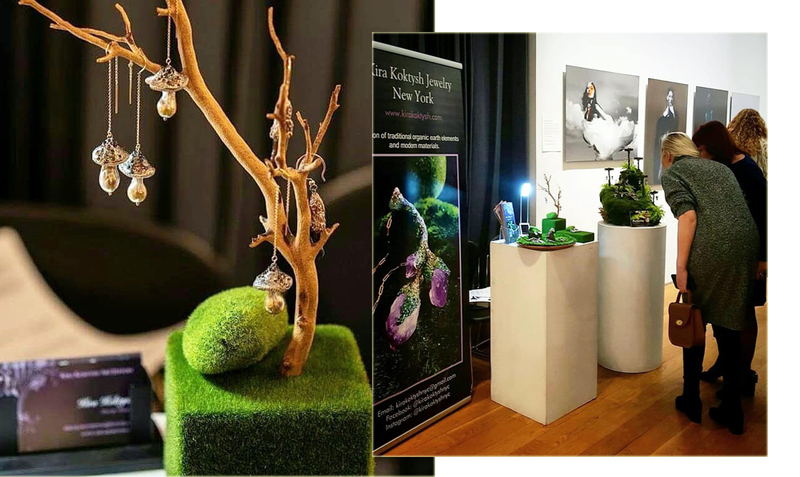 The offered products are made with sculptural fragments in a modern style, using the semiprecious and precious stones as well as diamonds.